difficult because of extremely feeble radiation. FIGURE-1 shows the optical figure. Combining the optical system of the Savart plate and polarized light and the detecting system of CCD sensor, it takes the interferogram of chemical luminescence and gets emitting spectrum by fourier transform. FIGURE-3 shows the details of the equipment. 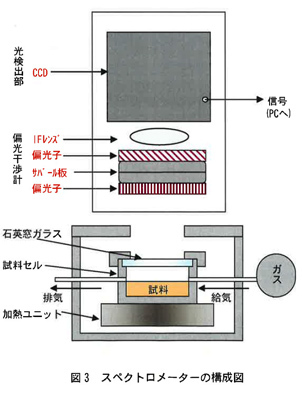 As the path difference is made between b1-c and b2-c of FIGURE-1 by combining the optical system of the Savart plate and polarized light and the detecting system of CCD image sensor, the interferogram is made on CCD mounted on lens focus. The emitting lights can be measure from all the wave fields at the same time. The range of measurable object is so wide. The measuring time can be set from 0.2 seconds to 2 hours. As it can be operated continually, you can pursuit the time change. The measuring temperature can be measured from normal temperature to 200-degree. The optical excitation can be done by ultraviolet rays, visible rays or near infrared rays. It can control to degrade oxidative by changing using gas to nitrogen. As the measured data can be made in EXCEL format, you can process it freely. It can be used for various sample by changing sample box. It can be operated easily and the training is not needed. If the rubber ring is measure as it is, it never emits light. It may be the emitting of single oxygen with oxidative rubber, however the intensities of 634mm and 703mm can be monitored differently. The chemical luminescence measures various subjects (Emitting Items), however one important target is Singlet Oxygen. 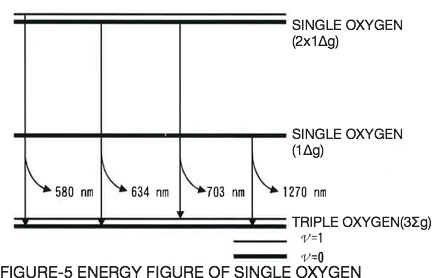 Singlet oxygen was one of the active oxygen, and oxygen (triplet oxygen) of the ground state was activated. Chemical Luminescence is the phenomenon that the matter receives some stress and emitted so weak light. The use in various fields is thought about as above. Please take the article using this technique into account. The article using this technique is announced. Please ask about Fourier-Transforming Chemical Luminescence Spectrometer to the followings.